Mr. Raveendranath, who was working at University Grants Commission (UGC) where he had submitted his resignation, was on his way to attend a meeting of Sri Lanka Association for the Advancement of Science (SLAAS) at Vidya Mawatta near Bauddhaloka mawatta where he was last seen by his driver at 12:30 a.m. The Vice Chancellor had instructed his driver to come back at 2:00 p.m. when the meeting is over. The driver contacted the family as he could not get in touch with Mr. Raveendranath, family members have told media. A complaint was registered at the Police around 9:30 p.m. Friday. Raveendranath, 55, and father of two girls, was living in Colombo as his resignation was not accepted by the UGC. Raveendranath began his carrer in 1978 in Karadiyanarau at the Institute of Agriculture, and he was a founder-member of the EUSL, founded in 1980. 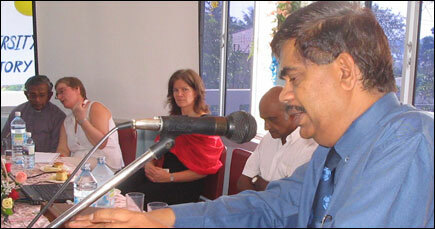 A senior lecturer of the Eastern University, Mr. Kumaravel Thambaiah, was shot and killed by the paramilitary group on 24 May 2004.